A connection object (ie the FlatFileConnection) that specifies a path to a file. The connection requires a FileFormat. The data flow object (ie the Source in the DataFlow which is a FlatFileSource). I do not think there is too much complexity in the Connection or [DataFlow] Source. There are really only a few attributes that need to be defined and, if you think about the nature of the task we are trying to achieve, there are all required. What is the most interesting is the specification of the FlatFileFormat. This defines the nature of the data that we are connecting to. Both at a header and detail level. For example consider the delimiter constructs for the header (HeaderRowDelimiter). You would think that the delimiter is applicable to the entire file but this is not the case and it also needs to be specified on a column by column basis. Finally, we also need to specify the new line on the last column. Perhaps that’s not so intuitive since we specify the row delimiter in the header section of the Format. So here is what we are trying to import. And here is the BIML snippet to import it. When we are working in a dynamic environment, we need to push through changes quickly and a prerequisite for this means starting from scratch. Starting with a blank database and deploying the build from a clean state. If you can’t drop and recreate the database, then the next best option is to clean it out, delete all the objects and recreate them as part of your build. We use TABLE_COUNT (initial value 1) to control the continued execution of the package (that is, the WHILE_TABLE_EXISTS container). This container runs while the TABLE_COUNT value is greater than 1 (or my database still has tables). The TABLES_IN_DB is an object that holds a list of table names, this is the result of the SQL Command GET_TABLE_LIST. The purpose here, is to query the database metadata in order to determine a list of names. The iterator FOREACH_RECORD_IN_TALBE_LIST enumerates over each record in the TALBES_IN_DB (assigning the table name to the variable TABLE_NAME). Within that container, we generate what SQL to execute (ie the drop command) in the GENERATE_SQL expression by assigning it to the SQL variable. Then we execute that variable via an Execute Command. Since we do not want the task to fail if the command does not work (after all there may be some dependencies between tables and execution order). Finally, after the first batch of executions has run (and hopefully all the tables are deleted), we recount the tables in the database, storing the values in the TABLE_COUNT variable. Control is then passed back to the WHILE_TABLES_EXIST to see if there are tables in the database and determine whether the process should begin again. You might notice that I am using an MYSQL ODBC database connection. Other features are commented in the code. As stated, there is no reliance on BIML Script here, so you may ask ‘Why use BIML?’. The reason for this is that the snippet includes samples of a few controls and how they are configured in different circumstances. Our prior posts showed techniques using the OLEDB Command to iterate over each row in the dataflow (see Biml XII and Biml XIII). 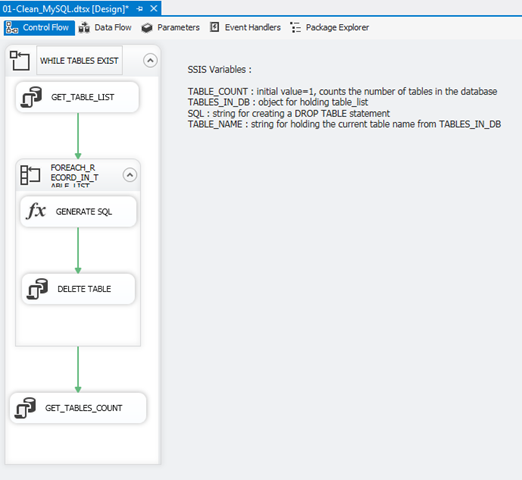 Using that task we fire an SQL statement for each row in the dataflow. Column (field) values can be passed to (and returned from) the command so the technique may be handy when a single (and arguably simple) statement is required. If we wish to embed more logic, tasks and more precise management into the iterative process, a different approach may be required. We could use a for loop task as an iterator. This operates in the control flow (as opposed to the OLEDB Command being a data flow task) and imbeds iteration in its own object container. Of course, we can still access field values from the dataset and obtain return values however, the use of container may improve usability (for SSIS control) because it can hold multiple tasks, implement precedence constraints and execute in entirety for each row that in a dataset. This post looks at how to implement this solution in Biml. The basic implementation of this technique of iteration is shown in the package below. The first Execute SQL task (read_dim) assigns the results of a query (the recordset) into a variable called sub_cat_results. The type of the variable is a System.Object and that variable is in the scope of the package. The recordset is simple (based on adventure works) and just returns ID’s and Names for product subcategories. The object of the next task (a for loop container titled for_each_record) is to iterate over each record in the dataset. As each ‘new’ row is encountered, field values for the row are assigned to the variables sub_cat_id and sub_cat_name. This assignment occurs in the outer part of the task so that those values can be accessed by other tasks within the bounds of the loop. Additionally the variables (sub_cat_id and sub_cat_name) are scoped so that they only exist within the loop container. There is really no requirement to do this (and they could exist in the package scope) however such a design policy may make the package more concise and modular. You can read more about variable scoping here. The loop container contains its own tasks which (of course) can access variables in the package and the loop container. We’ve used Execute SQL tasks in this example however, we are not limited to only these tasks. Naturally the parameter value passed is held in the sub_cat_id variable. We have not implemented any precedence constraints in the for loop container – it is kept simple for the purposes of demonstrations. The variable sub_cat_results is defined as a child of the package. Since we want to limit the scope of the sub_cat_id and sub_cat_name variables to the loop container, they are defined as children of that task (ForEachAdoLoop). The first SQL task (read_dim) needs to return a recordset and assign it to the variable sub_cat_results. In order to do this, we need to set the ResultSet property of the task (to Full) and configure the Results tag of the task. Our iterator (see the tag ForEachAdoLoop) has properties which specifies the variable that holds a recordset (sub_cat_results) and the precedence constraint that is applicable to the task. Of course that constraint can be overwritten on a task by task basis. As stated above, the variables that are to be used with the loop container are defined with the container (see the Variables child tag). Had these variables been defined as children of the package, they would not need to be defined at the task (loop task) level. However, note the naming convention where the variables are used within the package (ie where called). The variable mapping within the loop refers to the sub_cat_id variable in a fully qualified manner (iteration_01.for_each_record.User.sub_cat_id). We could also create the package without fully qualification (ie User.sub_cat_id) if we wish. The tasks within the loop container are held within a tasks tag. This is exactly the same as tasks are defined within the package and so we may liken the containers definition to that of the package. Traditional SSIS development requires the ETL developer to create a package and then manually add and configure tasks. While this method of visual development is fine, it suffers from reproducibility and maintenance overhead. For example, imagine (a very contrived scenario) where you create a package with a single ‘Execute SQL Task‘ and configure it to fire a procedure. Simple enough but now suppose you want to create a new package and fire a different proc – here you have to manually go in and follow all the same steps again. Perhaps not so bad but what if you create 10 packages and then decide that the Execute SQL Task should be prefixed EXSQL, you would have to manually go into each package and rename the task. This could be very cumbersome and it (by nature) carries a maintenance burden (or maintenance overhead). BIML (Business Intelligence Markup Language) is an XML specification that (amongst other things) allows you to specify the creation SSIS packages. One of the great things about BIML is that it can also include code snippets that amplifies the ability to generate code. This first post will form part of a series that show how to use BIML to create packages and what type of outcome we can achieve. But (of course) first things first so let’s start with a simple goal, so let’s look at using BIML to generate a package that executes an SQL command. Before we continue, a quick revisit my above comments about maintainability for a moment. An SSIS package is really just an XML file right, so why can’t I just edit that? If you’ve ever played around with an SSIS package, you’ll probably know that it is an XML file. You can see this by viewing the code of your packages as shown below (right click on the package and view code). So you may think that you can generate or alter this pretty easily. However, I have found this XML to be very finicky. Suppose you wanted to redefine a connection by editing script (something which should be simple you’d think and I’ve discussed here). You would expect that you could just examine the code, find the connection string, alter it and save it. But I’ve never had any success in that approach. When you try to open the file again (using the visual designer) it is invalid so your pretty much helpless with the changes you tried to make (sorry but there’s no comeback). That’s only to change an existing package so the creation of a package is (IMO of course) is just not possible. You could use an API but that just seems out of reach for most. Of course, newer versions of SSIS have project wide objects (like connections). Using these would naturally require less maintenance however were are still faced with task management (altering and creation) and package development. Further, if we want to define a group of packages by meta-data (say for example a list of tables to extract), there is no current way to do it in SSIS. A much simpler approach is BIML with give us a generic specification to development. What do I Need to get running with BIML? BIML is available when BIDS helper is installed. BIDS Helper is a community addin for SQL Server Data Tools (SSDT and BIDS) and is available on code plex. If you haven’t heard of BIDS helper before, take some time to look around the features. It really is a must have for business intelligence development in the Microsoft space. Once BIDS helper is installed, you can add a new BIML file by right clicking on the Project (or SSIS Packages) node and selecting ‘Add New Biml File‘. The file is created in the Miscellaneous Folder (as shown below). A single BIML file can contain the code that creates many packages (as will become apparent) but for now would we will just work with the basics and use it to create a package that fires an SQL statement. Opening the BimlScript file shows the XML in the file (we should probably rename it to give it a decent name but we will not worry about it this time). When you start, the file just contains the root node (as below). What BIML now allows us to do is create objects within the root (and later other nodes). For example, since we want to create a package, we naturally expect that we need to add a package child. Naming is pretty intuitive since it follows the SSIS object names. I’ve already hinted that we can use the same file to create multiple packages so it seems natural that a package tag should be embedded within a packages tag. Something like the following. Actually, I did cheat a little (and so can you). The intellisense functionality lets you know what tags are allowed at the position you are. Remember in XML that a tag is just an identifier for an object so since I want to do something in within by BIML tag (where else would I put it), I can just open a tag and see what options are available. I want to create a package (so a search for package shows I can add packages and of course within that, I can add a package). Back to our package snippet. We’ve got the packages declaration (as above) to specify a package within a packages node. You’d expect there is a way to validate the XML to be sure it has the required information to create packages? Well, just right click on the (explorer solution) and select ‘Check Biml for Errors‘. A dialog opens with a list of errors. If we think about it, it makes sense doesn’t it? Of course we need to give our packages a name! In contrast, the error for ConstraintMode is something that we take for granted when we generate packages visually. We define the order of tasks in a package through constraints (or connectors). However Biml has no indication and so the layout of tasks other than the order in which they appear in XML. How they relate to each other must be defined in the package declaration and this is the purpose of the ConstraintMode property. There are two allowable values for this property (either parallel or linear) which (as the name suggests) specifies that tasks will not be connected or connected sequentially. We now have everything that we need to generate packages from the script. Simply right click on the Biml file and select the Generate SSIS Packages (as above). You’ll see a new packages create under the SIS packages node in solution explorer. Of course there are no tasks in our package. Adding the Execute SQL task to the Package. the connection would be required before the command. Turns out that the Biml to add this task to our package is pretty straightforward. 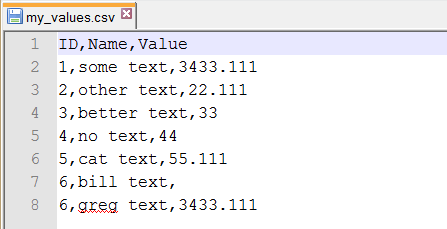 Of course you can use the IntelliSense to suggest what nodes are available and, when you look at the code and think about what you’re trying to do it seems to make sense (that is, create a connection, create a package, at a task to the package uses a connection and has some syntax). This produces package_01 which looks like and we can see how the specification of ConstraintMode has caused SQL_CMD_1 to link to SQL_CMD_2. Note the output from the second package definition (where ConstratinMode is Parallel) does not introduce precedence constraints between the 2 tasks. This post has looked at using Biml to create packages in SSIS. It’s a pretty simple example, but we can see how the XML biml can be used to automatically create (and recreate) packages. If we wanted to change a property (say for example the SQL syntax), we could just change it in the code and regenerate the packages. In later posts, we’ll extend this functional knowledge for more complicated scenarios.